LA. Youth + Art = New World - Artful Living Movement:​The Art of Being You! Today……I met some amazing people and we enjoyed art on the streets of Downtown L.A. together…Ah..the youth – they light up the world! …I also met the First Curator of “Global Mural Space,” the future’s global organization organizing mural art on prominent buildings in every major city on each continent, including Mars. ………………………and all these amazing people “GET” the creative spirit. They get it. They understand the value of public art – of freedom of expression – of peace through art – art in itself – that a community can flourish with diversity of culture AND perspective. That colors and form and individual styles have value. Now……………………how cool is that? 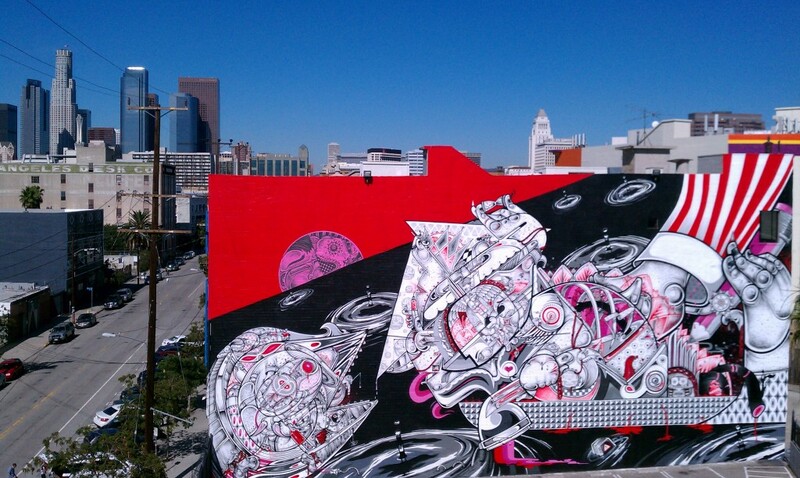 SO ON THIS DAY, the downtown LA Graffiti Art Scene had a 3-Block Art Party. Mural by JR, part of a series called "Wrinkles of the City Project"
We were so fortunate to tour with the staff of the Mural Conservancy of Los Angeles http://www.lamurals.org/ , Graffiti Artist “Vyal,” and Curator and Founder of LA Free Walls Project, Daniel Lahoda. As much as I was intrigued by the spectre of the walls, I must admit that my biggest fascination was with the human spirit – encapsulated by the youth and their sense of curiosity and awesomeness (plus, the stunning amazement for many who rode the Metro Subway for the first-time –a really magnificent experience I must say! ); the passion of artists committed to create…let me repeat..CREATE. not destroy. CREATE. Create what? Something else, something new, an alternative to what we see everyday… a new perspective… a new way to converge… a new way to emerge… a way to relate… a way to accept… to create peace …through a piece.. hmm..
And I must say, that I am fascinated by the passion of those who GET IT. Of course, I was thinking about the amazing teachers who were guiding their students throughout the day – inserting gems of wisdom, while making sure that the head count was the same at every stop. And of course, I was thinking about those who are support IT in other ways. In their work life or maybe even life’s passion…through their words of support, their appreciation… or maybe just taking the time to reflect on it… or maybe it’s that person who can simply acknowledge art’s existence and recognize it has value. I subscribe to it all – the love of creating peace. Piece by piece. Lending your ears and your voice…so we can have a conversation..that’s peaceful…that’s FULL of PEACE. Gaze at an image or gaze into the eyes of one as one speaks… deeply gaze… and SEE. That there is more, way more than what meets the eye. Our eyes can demonstrate peace… a peace of knowing…or getting there…AND THEN…BEING there. For me, the peace is seeing the lightbulb go on, a spark go off, the lightning striking…. Los Angeles, as of 2011, has the world’s largest concentration of murals, making it the center of street art around the globe. In L.A., 64+ murals exist, covering over 100,000 square feet of wall space. That’s A LOT ofwall. Did you know….that the difference between a sign and a mural is that a “sign” must be more than 80% text? Next time you attend a protest such as Occupy LA, you can hold up a big sign that says “PEACE, NOW” and a second sign with an image of Obama or the United Nations handing out food, medicine, and books over every continent (instead of warplanes and grenades.) This will emphasize your message and in two languages: a mural piece and a sign = Message for Peace. LA Free Walls Project Founder/Curator Daniel Lahoda talk about the significance of the LA mural scene. Vyal was the only graffiti artist present to talk about his work. Born in Monterey Park and raised in Montebello, he started his graffiti art interest as a 13-year old. Interesting thought: While it’s not the case for all graffiti artists, it’s been stated that graffiti art has the reality of being at the crossroads of gang violence. Vyal shared how several of his friends had been killed or shot while painting murals during the time of a drive-by. Factoid: Did you know? – That it’s considered “Aggressive” to paint over another mural/graffiti art piece? Yes, it is. In Downtown LA’s artist district there’s a piece called “Peace in Congo” by the non-profit organization, “Falling Whistles” is a controversial piece because it was pasted over an existing mural. Because of miscommunication between the artist, building owner, and organizers, the new piece was put up…over an existing one which was a collaboration project between artists in LA and in New Zealand. The Mural Conservancy explains the controversy of the art piece, "Peace in Congo. The blessing to be understood behind this story is that both pieces – “Peace in the Congo” and the previous piece are examples of amazing art. Powerfuland Provocative. AND, according to the Conservancy, this project is a good controversial example of why Los Angeles needs better ordinances for graffiti art/murals – so that a respectful and accountable line of communication takes place with all those involved, so there’s protection for art and artists, so rather than compete for “limited” space, there’s more than enough space for powerful and provocative art to co-exist. Who doesn’t know about Shepherd Ferry? OBEY… OBAMA, BE THE CHANGE… This piece right here is called “Peace Goddess.” Significant because it is the first piece curated by LA FREE WALLS PROJECT- and I would add, the image of a goddess overhead is pretty darn gorgeous and revealing; and….. Controversial, because apparently with this piece, an unrecognized artist posted ON TOP of the original piece, damaging it. Why? To ride on the notoriety of Ferry’s famous name. It was restored days later and with the fine and remorse of the offending artist. Lesson learned. Last stop: "Heartship" Mural by How & Nosm. This mural took 6 days straight to paint. It directly faces the Southern California Institute of Architecture. Close inspection of the mural illustrates a musician and illustrator being kicked by the state represented by the foot wearing red stripes. For a DETAIL of “Heartship” from above, CLICK HERE. ONE LAST COMMENT to close all comments. CREATIVITY is REAL and makes a difference. Artists create for many reasons – it’s a response, it’s a feeling, an urgency, a beckoning, a necessity, it’s something that parts of society can try to ignore, debase, be offended by, and reject but it doesn’t devalue its importance or deny its existence. In speaking of it, writing of it, seeing it posted up all over a wall as we walk through its doors, see through its windows, cast a shadow on it when walking by, or in giving it an un/conscious stare– the color, the form, and the energy in the painting becomes real, and this energy fuels the artist to keep making, for us to keep engaging, to strive for something more – or the option of having something else.